Ever since March arrived seven days ago, I've been experiencing some major spring fever. Although this has been an abnormally mild winter, the weather still isn't quite warm enough to be sporting my favorite spring items. An easy way to look springy, while still keeping warm, is to dress in lighter colors. We've established that the no white after Labor Day rule has long gone out the window, so pulling off an all white, or neutral colored look is perfect for this transitional stage. I paired my white jeans with a white silk blouse, and finish my look with a light color faux leather jacket for a warm, yet spring approved look. You look great, Rachael! I adore that jacket. The way that it is cut and lays is very different. I agree that white after Labor Day has gone out of the window and wear white pants, jeans, sweaters, etc, but I cannot make myself wear white shoes or boots even though I know that's not a rule any longer. LOL! You know I love a good neutral look! Your white jeans look amazing on you! Looking great in neutrals, nothing is quite as fresh! These neutrals are so lovely together! And I love the delicate gold necklace you added. I love that pastel hued lapel blazer. So simple but chic! Absolutely love this outfit! You look great! So pretty! 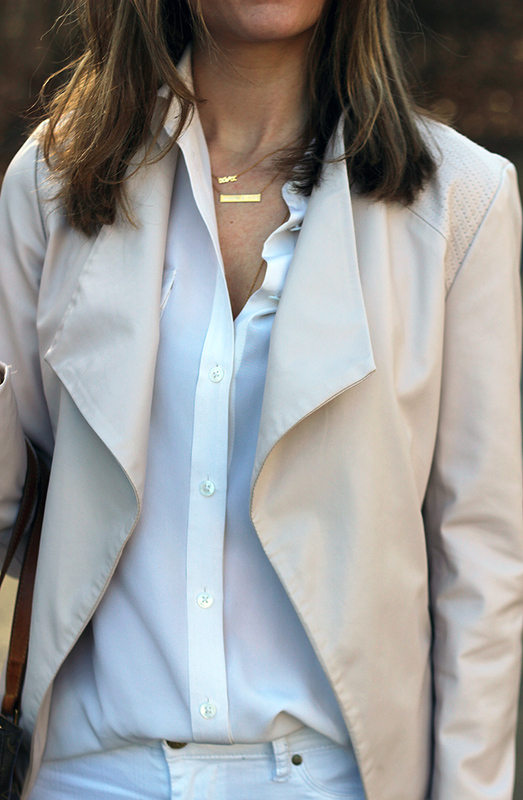 I am loving this neutral Spring look!! Your jacket is beautiful. Looking forward to the super warm temps tomorrow! I love light colored neutrals paired together!! Great look for spring! This is such a great way to bring some spring shades in your look while still feeling warm. LOVE the leather jacket. Love the fresh look of Spring in your outfit - Enjoy the rest of the week! You always do neutrals and pastels so well but this is the best yet. Love your booties and this rose quartz faux leather jacket is perfection Rachel. Wish I had that jacket to repeat this outfit head to toe, myself.